본 발명은 여러 스케줄링 주기 동안 점대다 멀티미디어 서비스의 데이터 전송이 없는 경우에는 네트워크는 일시적으로 스케줄링 메시지의 수신을 유보할 것을 알려주는 수신 유보 정보를 단말에게 전송하고, 단말은 상기 수신 유보 정보에 따라 일시적으로 스케줄링 메시지의 수신을 유보할 수 있도록 하여, 점대다 멀티미디어 서비스의 데이터를 불연속적으로 수신하는 단말이 배터리와 같은 단말 자원을 효율적으로 사용하도록 하는 점대다 멀티미디어 서비스(point-to-multipoint multimedia service) 전송 및 수신 방법에 관한 것이다. The present invention, when many-to-many points for several scheduling periods with no data transmission for multimedia services, the network is temporarily and for the reception reservation information indicating that to reserve reception of a scheduling message transmitted to the UE, the UE according to the received reservation information temporarily as by making it reserves reception of scheduling messages, point-to-multipoint-to-multipoint multimedia service (point-to-multipoint multimedia service) to the terminal for receiving data of a multimedia service discontinuously so as to efficiently use the UE resources, such as a battery, It relates to a transmission and reception method. 도1은 일반적인 UMTS의 망 구조를 나타낸 도면. Figure 1 is a view of the network structure of a general UMTS. 도2는 3GPP 무선 접속망 규격에 기반한 UE와 UTRAN 사이의 무선 인터페이스 (Radio Interface) 프로토콜의 구조를 나타낸 다이어그램. Figure 2 is a diagram showing the structure of a radio interface (Radio Interface) protocol between the UE and the UTRAN based on 3GPP radio access network standard. 도3은 종래기술에 있어 단말에서 MBMS 서비스 수신을 위한 채널 매핑의 예를 도시한 도면. 3 is in the prior art diagram showing an example of channel mapping for MBMS service reception at the terminal. 도4는 종래기술에 있어 MBMS 데이터 전송을 위한 MCCH 정보의 전송을 설명하기 위한 도면. 4 is in the prior art view illustrating the transmission of the MCCH information for the MBMS data transmission. 도5는 종래기술에 있어 MTCH가 매핑되는 SCCPCH를 통해 불연속적인 MBMS 데이터, 스케줄링 정보의 전송을 예시한 도면. 5 is in the prior art diagram illustrating a transmission of discontinuous MBMS data, scheduling information over the SCCPCH which MTCH is mapped. 도6은 본 발명에 따른 점대다 멀티미디어 서비스 전송 및 수신 방법의 바람직한 일 실시예를 설명하기 위한 도면. 6 is a view for explaining an embodiment of the point-to-multipoint multimedia service transmission and reception method according to the invention. 도7은 본 발명의 바람직한 일 실시예에 따라 이동통신 시스템의 단말에서 매 스케줄링 주기마다 UTRAN으로부터 전송된 스케줄링 메시지를 수신하여 수신된 스케줄링 메시지에 따른 처리 절차를 도시한 도면. Figure 7 is a view showing a processing procedure according to the received scheduling message every scheduling period in a terminal of a mobile communication system receives a scheduling message transmitted from the UTRAN according to an exemplary embodiment of the present invention. 본 발명은 점대다 멀티미디어 서비스(point-to-multipoint multimedia service) 제공 방법에 관한 것이다. The present invention point-to-multipoint on the multimedia service (point-to-multipoint multimedia service) service method. 보다 구체적으로는, 여러 스케줄링 주기 동안 점대다 멀티미디어 서비스의 데이터 전송이 없는 경우에는 네트워크는 일시적으로 스케줄링 메시지의 수신을 유보할 것을 알려주는 수신 유보 정보를 단말에게 전송하고, 단말은 상기 수신 유보 정보에 따라 일시적으로 스케줄링 메시지의 수신을 유보할 수 있도록 하여, 점대다 멀티미디어 서비스의 데이터를 불연속적으로 수신하는 단말이 배터리와 같은 단말 자원을 효율적으로 사용하도록 하는 점대다 멀티미디어 서비스(point-to-multipoint multimedia service) 전송 및 수신 방법에 관한 것이다. To be more specific, when many-to-many points for several scheduling periods with no data transmission for multimedia services, the network is temporarily transmitted to the mobile station to the reception reservation information indicating that to reserve reception of a scheduling message, the UE reserves the received information in accordance with to temporarily reserves reception of scheduling messages, point-to-multipoint-to-multipoint multimedia service (point-to-multipoint to the terminal for receiving data of a multimedia service discontinuously so as to efficiently use the UE resources, such as a battery, multimedia service) relates to a transmission and reception method. 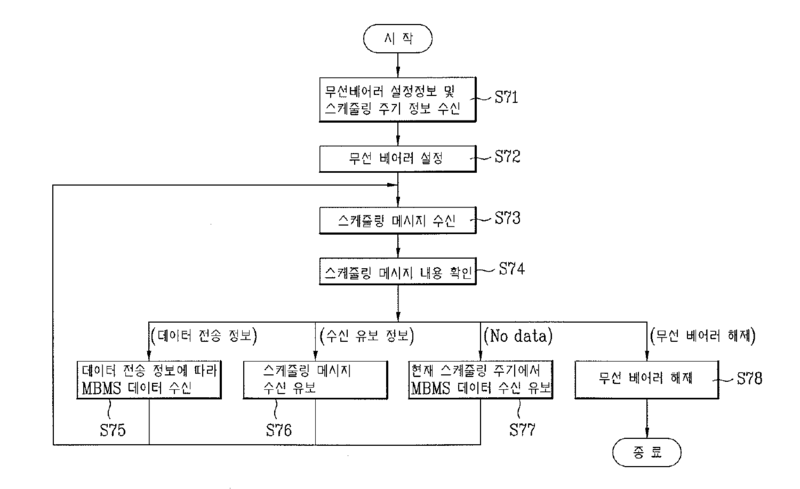 도1은 종래 및 본 발명이 적용되는 UMTS(Universal Mobile Telecommunications System)의 망구조를 나타낸 그림이다. 1 is a figure showing a network structure of (Universal Mobile Telecommunications System) and UMTS is the prior invention is applied. UMTS시스템은 크게 단말(User Equipment; UE라 약칭함)과 UTMS무선접속망(UMTS Terrestrial Radio Access Network; 이하 UTRAN라 약칭함) 및 핵심망(Core Network; 이하 CN이라 약칭함)으로 이루어져 있다. UMTS system greatly terminal consists of, (hereinafter referred to as Core Network CN) (User Equipment;; abbreviated as UE la) and UTMS radio access network (UMTS Terrestrial Radio Access Network hereinafter abbreviated UTRAN) and a Core Network. UTRAN은 한 개 이상의 무선망부시스템(Radio Network Sub-systems; 이하 RNS라 약칭함)으로 구성되며, 각 RNS는 하나의 무선망제어기(Radio Network Controller;이하 RNC라 약칭함)와 이 RNC에 의해서 관리되는 하나 이상의 기지국(이하 Node B)으로 구성된다. The UTRAN has one or more radio mangbu system; consists of a (Radio Network Sub-systems hereinafter abbreviated RNS), each RNS has a radio network controller (Radio Network Controller; hereinafter abbreviated RNC) and managed by the RNC which consists of one or more base stations (hereinafter referred to as Node B). 하나의 Node B에는 하나이상의 셀(Cell)이 존재한다. A Node B, there are one or more cells (Cell). 도2는 3GPP 무선접속망 규격을 기반으로 한 단말과 UTRAN (UMTS Terrestrial Radio Access Network) 사이의 무선인터페이스 프로토콜 (Radio Interface Protocol)의 구조를 나타낸다. 2 shows a structure of a radio interface protocol (Radio Interface Protocol) between one based on the 3GPP radio access network standard terminal and the UTRAN (UMTS Terrestrial Radio Access Network). 도2의 무선인터페이스 프로토콜은 수평적으로 물리계층(Physical Layer), 데이터링크계층(Data Link Layer) 및 네트워크계층(Network Layer)으로 이루어지며, 수직적으로는 데이터정보 전송을 위한 사용자평면(User Plane)과 제어신호(Signaling)전달을 위한 제어평면(Control Plane)으로 구분된다. Radio interface protocol of Figure 2 is horizontal to the physical layer (Physical Layer), made of a data link layer (Data Link Layer) and a network layer (Network Layer), vertical to a user plane for data information transfer (User Plane) It is divided into a control signal (Signaling) the control plane (control plane) for delivery. 도 2의 프로토콜 계층들은 통신시스템에서 널리 알려진 개방형시스템간상호접속 (Open System Interconnection; OSI)기준모델의 하위 3개 계층을 바탕으로 L1 (제1계층), L2 (제2계층), L3(제3계층)로 구분될 수 있다. FIG protocol layer 2 are well-known Open Systems Interconnection in a communication system (Open System Interconnection; OSI) based on three lower layers of the reference model L1 (first layer), L2 (second layer), L3 (the a three-layer) can be distinguished. 이하 상기 도 2의 각 계층을 설명한다. Hereinafter will be described the each layer of the two. 상기의 제1계층인 물리계층은 물리채널(Physical Channel)을 이용하여 상위 계층에게 정보전송서비스(Information Transfer Service)를 제공한다. A first layer, the physical layer of the provides a physical channel (Physical Channel) information transfer service (Information Transfer Service) to an upper layer by using a. 물리계층은 상위에 있는 매체접속제어(Medium Access Control)계층과는 전송채널(Transport Channel)을 통해 연결되어 있으며, 이 전송채널을 통해 매체접속제어계층과 물리계층 사이의 데이터가 이동한다. The physical layer and MAC (Medium Access Control) layer in the top is connected via a transmission channel (Transport Channel), and the data movement between the transport channel to a medium access control layer and the physical layer via. 그리고, 서로 다른 물리계층 사이, 즉 송신측과 수신측의 물리계층 사이는 물리채널을 통해 데이터가 이동한다. Then, each data is moved between different physical layers, i.e., the transmitting side and the receiving side of the physical layer through a physical channel. 제2계층의 매체접속제어 (Medium Access Control; 이하 MAC이라 약칭함)는 논리채널(Logical Channel)을 통해 상위계층인 무선링크제어(Radio Link Control)계층에게 서비스를 제공한다. The second medium access control layer (Medium Access Control; hereinafter referred to as MAC) and provides the service to the logical channels (Logical Channel) in a radio link control upper layers through (Radio Link Control) layer. 제2계층의 무선링크제어(Radio Link Control; 이하 RLC라 약칭함)계층은 신뢰성 있는 데이터의 전송을 지원하며, 상위계층으로부터 내려온 RLC 서비스데이터단위(Service Data Unit; 이하, SDU라 약칭함)의 분할 및 연 결 (Segmentation and Concatenation) 기능을 수행할 수 있다. Second radio link control layer; support the transmission of data (Radio Link Control below RLC la abbreviated hereinafter) layer is reliable and, RLC service data unit comes down from an upper layer; of (Service Data Unit hereinafter abbreviated as, SDU) It can perform segmentation and connections (segmentation and Concatenation) function. 제3계층의 가장 하부에 위치한 무선자원제어(Radio Resource Control; 이하 RRC라 약칭함)계층은 제어평면에서만 정의되며, 무선베어러 (Radio Bearer; RB라 약칭함)들의 설정(Configuration), 재설정(Re-configuration) 및 해제(Release)와 관련되어 논리채널, 전송채널 및 물리채널들의 제어를 담당한다. The RRC is located in the lower portion of the third layer (Radio Resource Control; hereinafter RRC la abbreviated as) layer is defined only in the control plane, the radio bearer (Radio Bearer; RB la abbreviated as) of the set (Configuration), reset (Re It is associated with a -configuration) and a release (release) is responsible for control of logical channels, transport channels and physical channels. 이 때, RB는 단말과 UTRAN간의 데이터 전달을 위해 제2계층에 의해 제공되는 서비스를 의미하고, 일반적으로 RB가 설정된다는 것은 특정 서비스를 제공하기 위해 필요한 프로토콜 계층 및 채널의 특성을 규정하고, 각각의 구체적인 파라미터 및 동작 방법을 설정하는 과정을 의미한다. At this time, RB is stipulating the characteristics of protocol layer and channel needed to sense the service and, in general, is that the RB is set to provide a specific service provided by the second layer for data transfer between the UE and the UTRAN, respectively It refers to the process of the set detailed parameters and operation methods. 이하 멀티미디어 방송/멀티캐스트 서비스(Multimedia Broadcast/Multicast Service;이하 MBMS로 약칭)에 대해 상술한다. Will be described for a, (hereinafter referred to as MBMS Multimedia Broadcast / Multicast Service) or less multimedia broadcast / multicast service. MBMS는 하향 전용의 MBMS 베어러 서비스를 이용하여 복수의 단말에게 스트리밍(Streaming) 또는 후선(Background) 서비스를 제공하는 방식을 말한다. MBMS refers to a method of using a downlink dedicated MBMS bearer service provides a streaming (Streaming) or the back-office (Background) services to multiple terminals. 하나의 MBMS 서비스는 하나 이상의 세션(Session)으로 구성되며, MBMS 데이터는 세션이 진행 중인(ongoing) 동안에만 MBMS 베어러 서비스를 통해 상기 복수의 단말에게 전송된다. One MBMS service is made up of one or more session (Session), MBMS data is transmitted to multiple terminals through the MBMS bearer service only for the duration (ongoing) being session. UTRAN은 무선베어러를 사용하여 MBMS 베어러 서비스를 단말에게 제공한다. The UTRAN provides the MBMS bearer service to terminals using an RB. UTRAN이 사용하는 무선베어러의 종류(Type)로는 점대점(Point-to-point) 무선베어러와 점대다(Point-to-multipoint) 무선베어러가 있다. Roneun type (Type) of a radio bearer to the UTRAN uses a point-to-point (Point-to-point) and point-to-multipoint radio bearer (Point-to-multipoint) radio bearer. 여기서, 점대점 무선베어러는 양방향 무선베어러(bi-directional RB)이며, 논리채널 DTCH(Dedicated Traffic Channel)와 전송채널 DCH(Dedicated Channel), 물리채널 DPCH(Dedicated Physical Channel) 또는 물리채널 SCCPCH(Secondary Common Control Physical Channel)로 구성된다. Here, the point-to-point radio bearer is a bidirectional radio bearer (bi-directional RB), and the logical channel DTCH (Dedicated Traffic Channel) as a transport channel DCH (Dedicated Channel), a physical channel DPCH (Dedicated Physical Channel) or a physical channel SCCPCH (Secondary Common consists Control Physical Channel). 또한, 점대다 무선베어러는 단방향 하향 무선베어러(uni-directional downlink RB)이며, 도3과 같이, 논리채널 MTCH(MBMS Traffic Channel)와 전송채널 FACH(Forward Access Channel), 물리채널 SCCPCH로 구성된다. In addition, the point radio bearer is a unidirectional downlink radio bearer (uni-directional downlink RB) many-to-many, as shown in Figure 3, consists of a logical channel MTCH (MBMS Traffic Channel) and transport channels (Forward Access Channel) FACH, physical channel SCCPCH. 논리채널 MTCH는 하나의 셀에 제공되는 하나의 MBMS 서비스마다 설정(configuration)되고, 특정 MBMS서비스의 사용자 평면 데이터를 복수의 단말에게 전송하기 위해 사용되는 채널이다. Logical channel MTCH is a channel that is set (configuration) for each one MBMS service provided to one cell and used to transmit user plane data of a specific MBMS service to multiple terminals. 도3과 같이, 논리채널 MCCH(MBMS Control Channel)는 점대다 하향채널(Point-to-multipoint downlink channel)로서 MBMS와 관련된 제어정보를 전송하기 위해 사용한다. As shown in Figure 3, a logical channel MCCH (MBMS Control Channel) is used to as a point-to-multipoint downlink channel (Point-to-multipoint downlink channel) transmitting control information related to the MBMS. 논리채널 MCCH는 전송채널 FACH(Forward Access Channel)에 매핑되고, 전송채널 FACH는 물리채널 SCCPCH(Secondary Common Control Physical Channel)에 매핑된다. Logical channel MCCH is mapped to the transport channel FACH (Forward Access Channel), a transport channel FACH is mapped to the physical channel SCCPCH (Secondary Common Control Physical Channel). 하나의 셀에는 하나의 MCCH만 존재한다. One cell, there is only one MCCH. MBMS 서비스를 제공하는 UTRAN은 MCCH 채널을 통해 MCCH 정보(MCCH Information)을 복수의 단말에게 전송한다. UTRAN providing the MBMS service transmits the MCCH information (MCCH Information) through the MCCH channel to a plurality of terminals. MCCH 정보는 MBMS와 관련된 통지(Notification) 메시지, 즉 MBMS와 관련된 RRC 메시지를 포함한다. The MCCH information includes an RRC message related to the notification (Notification) message, that is associated with the MBMS MBMS. 예를 들어, MCCH 정보는 MBMS 서비스 정보를 알려주는 메시지, 점대다 무선베어러 정보를 알려주는 메시지, 특정 MBMS 서비스를 위해 RRC연결(RRC Connection)이 요청됨을 알려주는 엑세스 정보(Access Information) 등을 포함한다. For example, MCCH information includes a message indicating MBMS service information, a message indicating the RB information many-to-many points, indicating that the RRC connection (RRC Connection) The request for a particular MBMS service is access information (Access Information), etc. do. 도4는 MCCH 정보의 전송방식을 나타낸다. Figure 4 shows a transmission method of MCCH information. MCCH 정보는 변경 주기(Modification Period)와 반복 주기(Repetition Period)에 따라 주기적으로 전송된 다. The MCCH information is periodically transmitted according to a modification period (Modification Period) and the repetition period (Repetition Period). MCCH 정보는 중요 정보(Critical Information)과 비중요 정보(Non-critical Information)으로 구분된다. MCCH information is divided into critical information (Critical Information) and non-critical information (Non-critical Information). 이들 중에서 비중요 정보는 변경 주기와 반복 주기마다 자유로이 변경하여 전송할 수 있다. Of these non-critical information can be transmitted to freely changed for each repetition period and modification period. 하지만, 중요 정보의 변경은 오직 변경 주기마다 변경하여 전송할 수 있다. However, the change of critical information can be transmitted by only changing every change cycle. 즉, 중요 정보는 반복 주기마다 한 번씩 반복하여 전송되며, 변경된 중요 정보의 전송은 오직 변경 주기의 시작 지점에서만 가능하다. In other words, important information is transmitted by a repeated once, the transmission of important information is changed for each repetition cycle is only possible to change only the starting point of the cycle. UTRAN은 변경 주기 동안에 MCCH 정보가 갱신되지는 여부를 알려주기 위해서 주기적으로 물리채널 MICH(MBMS 통지 지시자 채널; MBMS notification Indicator Channel)를 전송한다. The UTRAN periodically the physical channel MICH to inform whether MCCH information is not updated during the period change; and transmits the (MBMS Notification Indicator Channel MBMS notification Indicator Channel). 따라서, 가령 하나의 특정 MBMS 서비스만을 수신하고자 하는 단말은 그 서비스의 세션이 시작되기 이전에는 MCCH 또는 MTCH를 수신하지 않고, 주기적으로 MICH(MBMS 통지 지시자 채널; MBMS notification Indicator Channel)을 수신한다. Thus, for example, a terminal desiring to receive a particular MBMS service is only without receiving the MCCH or MTCH Prior to the session start of the service, periodically MICH; receives (MBMS Notification Indicator Channel MBMS notification Indicator Channel). 참고로, 본 명세서에서 MCCH 정보의 갱신은 MCCH 정보 중 특정 항목의 생성, 추가, 변경 또는 제거를 말한다. For reference, the update of the MCCH information in the present specification refers to a generation, addition, change, or removal of a specific item of the MCCH information. 특정 MBMS 서비스의 세션이 시작되면, UTRAN은 특정 MBMS 서비스를 수신하고자 하는 단말에게 MCCH 채널을 수신할 것을 통지하는 지시자인 NI(Notification Indicator)를 MICH를 통해 전송한다. When a particular MBMS service session starts, the UTRAN is (Notification Indicator) NI an indicator that notifies that to receive the MCCH channel to a UE desiring to receive a particular MBMS service is transmitted on the MICH. MICH를 통해 상기 지시자 NI를 수신한 단말은 MICH가 지시하는 특정 변경 주기 동안 MCCH를 수신한다. The terminal receives the indicator NI through the MICH receives an MCCH during a specific period changes to an instruction MICH.
점대다 무선베어러를 사용하여 특정 MBMS 서비스를 수신하고자 하는 단말은 MCCH 채널을 통해 무선베어러 정보를 포함하는 MCCH 정보를 수신하고, 그 정보를 이용하여 상기 점대다 무선베어러를 단말에 설정한다. UE desiring to receive a specific MBMS service to point-to-multipoint RB using the MCCH channel is through receives MCCH information including radio bearer information, and the point-to-multipoint radio bearer set up to the terminal using the information. 단말은 상기 점대다 무선베 어러를 설정한 후, MTCH가 매핑된 물리채널 SCCPCH를 계속 수신하여, MTCH를 통해 전송되는 특정 MBMS 서비스의 데이터를 획득한다. The UE then sets the radio bearer of the point-to-multipoint, and continues to receive a physical channel SCCPCH the MTCH is mapped, to acquire data of the specific MBMS transmitted via the MTCH. 도5와 같이, UTRAN은 MTCH를 통해 불연속적으로 MBMS 데이터를 전송할 수 있다. As shown in Figure 5, UTRAN may transmit MBMS data discontinuously via the MTCH. 이 때, UTRAN은 MTCH가 매핑되는 SCCPCH(SCCPCH carrying MTCH)를 통해 주기적으로 스케줄링 메시지(Scheduling message)를 단말에게 전송한다. At this time, UTRAN periodically transmits a scheduling message (Scheduling message) to the UE through the SCCPCH (SCCPCH carrying MTCH) which MTCH is mapped. 여기서, 스케줄링 메시지는 하나의 스케줄링 주기 동안에 전송되는 MBMS 데이터의 전송 시작 시점과 전송 구간을 알려준다. Here, the scheduling message informs a transmission start time and transmission period of MBMS data transmitted during one scheduling period. 이를 위해, UTRAN은 단말에게 스케줄링 정보의 전송 주기(스케줄링 주기; Scheduling Period)를 미리 알려주어야 한다. Should inform the; (Scheduling Period scheduling period) in advance for this purpose, UTRAN is a transmission period of scheduling information to the UE. 한편, 단말은 먼저 UTRAN으로부터 스케줄링 주기를 획득하고, 그 획득한 스케줄링 주기에 따라 주기적으로 스케줄링 메시지를 수신하며, 그 수신한 스케줄링 메시지를 이용하여 MTCH가 매핑되는 SCCPCH(SCCPCH carrying MTCH)를 불연속적으로 그리고 주기적으로 수신한다. On the other hand, the UE in the SCCPCH (SCCPCH carrying MTCH), first being obtained the scheduling period from the UTRAN and, and periodically receives the scheduled message according to the acquired scheduling period, MTCH is mapped by using the received scheduling message discontinuously and periodically received. 즉, 단말은 스케줄링 메시지를 이용하여, 데이터가 전송되는 시간 구간에는 MTCH가 매핑되는 SCCPCH를 수신하고, 데이터가 전송되지 않는 시간 구간에는 MTCH가 매핑되는 SCCPCH를 수신하지 않는다. That is, the UE using the scheduling message, the time interval at which data is transmitted, receiving the SCCPCH which MTCH is mapped, and, in the time interval data is not being transferred does not receive the SCCPCH which MTCH is mapped. 이러한 방식의 장점은 단말이 효율적으로 데이터를 수신하도록 하여 단말의 배터리 소모를 줄이는 것에 있다. The advantage of this method is that by reducing the battery consumption of the terminal to receive data in the UE efficiently. 종래기술에서는 여러 스케줄링 주기 동안 데이터 전송이 없는 경우에도 단말은 계속해서 스케줄링 메시지를 주기적으로 수신해야 하므로, 배터리와 같은 단말자원을 낭비하는 문제점이 있다. Therefore, even if the prior art there is no data transmission for several scheduling periods the terminal continues to receive the scheduling messages periodically, there is a problem that a waste of UE resources like battery. 종래기술에서 단말은 데이터 전송이 있는 여부와 관계없이 주기적으로 스케줄링 메시지를 확인한다. In the prior art, the UE check the scheduling messages periodically regardless of whether or not there is a data transfer. 즉, 원칙적으로 어떤 데이터도 전송되고 있지 않다면, 단말은 MTCH가 매핑되는 SCCPCH를 수신할 필요가 없고, 따라서 단말은 단말자원을 소모할 필요가 없다. That is, if in principle, any data is not being transmitted, the terminal does not need to receive the SCCPCH which MTCH is mapped, and thus the UE does not need to consume resources to the terminal. 하지만, 이러한 경우에도 스케줄링 메시지를 주기적으로 확인해야 하므로, MTCH가 매핑되는 SCCPCH를 수신하기 위해서 단말은 단말 자원을 소모해야 하는 문제가 발생한다. However, since these also need to check the scheduling messages periodically case, in order to receive the SCCPCH which MTCH is mapped, the UE there arises a problem that the terminal should consume resources. 본 발명은 상기한 바와 같은 종래기술의 문제점을 해결하기 위하여 안출된 것으로서, 본 발명의 목적은 여러 스케줄링 주기 동안 점대다 멀티미디어 서비스의 데이터 전송이 없는 경우에는 네트워크는 일시적으로 스케줄링 메시지의 수신을 유보할 것을 알려주는 수신 유보 정보를 단말에게 전송하고, 단말은 상기 수신 유보 정보에 따라 일시적으로 스케줄링 메시지의 수신을 유보할 수 있도록 하여, 점대다 멀티미디어 서비스의 데이터를 불연속적으로 수신하는 단말이 배터리와 같은 단말 자원을 효율적으로 사용하도록 하는 점대다 멀티미디어 서비스(point-to-multipoint multimedia service) 전송 및 수신 방법을 제공하는 것이다. The present invention been made in view of solving the problems of the prior art as described above, when many-to-many object of the invention is that for several scheduling periods with no data transmission for multimedia services, the network is temporarily reserves the received scheduling message sends a reception reservation information indicating that a terminal, the terminal and to temporarily reserve the reception of a scheduling message in accordance with the received reservation information, point-to-multipoint a terminal for receiving data of a multimedia service discretely, such as a battery, many-to-many points to use the resources efficiently terminal to provide multimedia services (point-to-multipoint multimedia service) transmission and reception method. 본 발명의 일 양상으로서, 본 발명에 따른 점대다 멀티미디어 서비스 수신 방법은, 점대다 멀티미디어 서비스(point-to-multipoint multimedia service)를 수신하는 단말에서 상기 점대다 멀티미디어 서비스를 제공하는 네트워크로부터 전송된 스케줄링 메시지(scheduling message)에 따라 상기 점대다 멀티미디어 서비스 데이터를 수신하는 방법에 있어서, 상기 네트워크로부터 소정 횟수 동안 스케줄링 메시지의 수신을 유보할 것을 지시하는 수신 유보 정보를 수신하는 단계; As one aspect of the invention, receiving point-to-multipoint multimedia service in accordance with the invention method, point-to-multipoint multimedia service (point-to-multipoint multimedia service) for a scheduled transmission from the terminal receiving from the network providing the multimedia service-to-multipoint the point depending on the message (message scheduling) a method for receiving multimedia service data, the many-to-many points, the method comprising: receiving a reception reservation information indicating that reservation to receive the scheduling message for a predetermined number of times from the network; 및 상기 수신 유보 정보를 수신한 직후부터 상기 소정 횟수 동안 스케줄링 메시지의 수신을 유보하고 상기 소정 횟수가 지난 다음에 전송되는 스케줄링 메시지를 수신하는 단계를 포함하는 것을 특징으로 한다. And reserves reception of scheduling messages for a predetermined number of times immediately after receipt of the received reservation information, and is characterized in that it comprises the step of the predetermined number of times receiving a scheduling message is sent to the last following. 본 발명의 다른 양상으로서, 본 발명에 따른 점대다 멀티미디어 서비스 전송 방법은, 점대다 멀티미디어 서비스(point-to-multipoint multimedia service)를 적어도 하나 이상의 단말에 제공하는 네트워크에서 스케줄링 메시지(schedudling message)를 이용하여 상기 점대다 멀티미디어 서비스의 데이터를 전송하는 방법에 있어서, 상기 적어도 하나 이상의 단말에 소정 횟수(N) 동안 스케줄링 메시지의 수신을 유보할 것을 지시하는 수신 유보 정보를 전송하여 상기 적어도 하나 이상의 단말이 상기 수신 유보 정보를 수신한 직후부터 상기 소정 횟수 동안 스케줄링 메시지의 수신을 유보하도록 하는 것을 특징으로 한다. In another aspect of the invention, the point-to-multipoint multimedia service transmission method according to the invention, point-to-multipoint by using the scheduling message (schedudling message) from the network providing the multimedia services (point-to-multipoint multimedia service) to at least one terminal the method for transferring data for the multimedia service-to-multipoint the point, where the at least one or more terminals in a predetermined number of times (N) scheduling message received reception reservation information transmitted to the at least one terminal for instructing to reserve for the immediately after receiving the reception reservation information it is characterized in that to reserve reception of a scheduling message during the predetermined number of times. 이하에서 첨부된 도면을 참조하여 설명되는 본 발명의 바람직한 실시예에 의해 본 발명의 구성, 작용, 효과 및 다른 특징들이 명확해 질 수 있을 것이다. The configuration of the present invention by the preferred embodiment of the present invention will be described with reference to the accompanying drawings, it will become action, effect, and other characteristics are clear. 이하에서 설명되는 실시예에서는 3GPP(3rd Generation Partnership Project)에서 표준화 작업이 진행되고 있는 비동기식 무선 이동통신 시스템에서 점대다 멀티미디어 서비스의 대표적인 예인 MBMS 서비스를 제공하는 방법을 중심으로 설명하였다. In the embodiments described below many-to-many points in the asynchronous radio mobile communication system in which standardization is in progress (3rd Generation Partnership Project) 3GPP has been described about the method for providing an MBMS service typical examples of multi-media services. 도6은 본 발명에 따른 점대다 멀티미디어 서비스 전송 및 수신 방법의 바람직한 일 실시예를 설명하기 위한 도면으로서, 물리채널인 SCCPCH를 통하여 스케줄 링 메시지 및 MBMS 서비스의 데이터를 전송하는 예이다. 6 is an example of transmitting data in a view for illustrating one embodiment of the point-to-multipoint multimedia service transmission and reception method according to the present invention, the scheduling message and the MBMS service through the physical channel SCCPCH. 도6에서, UTRAN은 스케줄링 주기마다 스케줄링 메시지를 전송한다. In Figure 6, UTRAN sends a scheduling message for each scheduling cycle. 상기 스케줄링 메시지는 하나의 스케줄링 주기 동안에 전송되는 MBMS 데이터의 전송 시작 시점과 전송 구간을 포함하는 데이터 전송 정보나 해당 스케줄링 주기에는 전송할 데이터가 없음을 나타내는 메시지 또는 수신 유보 정보 등을 포함할 수 있다. The scheduling message may include a message or receive a scheduling period represents the data transfer information and the scheduling period has no data to transfer, including a transmission start time and transmission period of MBMS data transmitted during the reservation information. UTRAN은 특정 MBMS 서비스에 대해 여러 스케줄링 주기(수신 유보 구간) 동안 연속적으로 전송할 데이터가 없을 경우, 전송할 데이터가 없는 구간 동안 전송되는 스케줄링 메시지를 통해 수신 유보 정보를 전송한다. The UTRAN transmits the absence of data successively transmitted, reservation received via the scheduling message that is transmitted during the transmit interval has no data information for several scheduling periods (reception reservation section) for a specific MBMS service. 상기 수신 유보 정보는 상기 스케줄링 메시지에 포함될 수도 있으나 다른 방법에 의해 전송되는 것도 가능할 것이다. The reception reservation information may be possible which may be included in the scheduling message, but transmitted by another method. 도6에 표시된 1번부터 6번까지의 스케줄링 메시지에 대한 UTRAN과 단말의 동작은 다음과 같다. An operation of the UTRAN and the UE for the scheduling message displayed in the 6 numbered 1 through 6 are as follows. UTRAN은 1번 스케줄링 메시지를 통해 1번 스케줄링 메시지와 2번 스케줄링 메시지 사이에 전송되는 데이터의 전송 정보를 단말에게 통지한다. UTRAN notifies the transmission information of the data transmitted between the first scheduling message and the time 2 scheduling message to the UE through the scheduling message once. 상기 전송 정보는 상기 데이터의 전송 시작점과 전송 구간의 길이를 포함한다. The transmission information includes a length of a transmission start point and transmission period of the data. 상기 단말은 스케줄링 주기마다 스케줄링 메시지를 수신한다. The UE receives the scheduling message every scheduling period. 1번 스케줄링 메시지를 수신한 단말은 그 메시지에 포함된 데이터의 전송 정보에 따라 1번 스케줄링 메시지와 2번 스케줄링 메시지 사이에 전송되는 데이터를 수신한다. Receiving a scheduling message once the UE receives the data transmitted between the first scheduling message once and twice scheduling messages according to the transmission information of the data contained in the message. UTRAN은 2번 스케줄링 메시지에 포함된 수신 유보 정보를 전송한다. The UTRAN transmits the reception reservation information included in the scheduling message twice. 도6에서 2번 스케줄링 메시지와 5번 스케줄링 메시지 사이에 해당 MBMS 서비스에 대해 전송 할 데이터가 없을 경우에, UTRAN은 2번 스케줄링 메시지에 포함되는 수신 유보 정보를 통해 3번과 4번의 스케줄링 메시지의 수신을 유보할 것을 단말에게 알려준다. In case there is at 62 times the scheduling messages and data to be transmitted for the MBMS service between the fifth scheduling message, UTRAN receives the scheduling message three times and four times through the reception reservation information included in the second time scheduling message It informs the terminal to be reserve. 더욱 구체적으로 설명하면, 여기서 수신 유보 정보에 포함된 스케줄링 메시지 수신 유보 구간의 값은 2이며, 이는 단말이 2번 스케줄링 메시지 전송 이후 전송되는 2개의 스케줄링 메시지의 수신을 유보해야 함을 단말에게 알려주는 것이다. More specifically, where the value of the reception reservation section scheduled message contained in the received reservation information is 2, which is a terminal box to indicate to the UE need to reserve reception of two scheduling messages transmitted after 2 scheduling message transmitted will be. 한편, 단말의 입장에서 설명하면 다음과 같다. On the other hand, when described from the perspective of the terminal as follows. 단말은 스케줄링 주기마다 스케줄링 메시지를 수신한다. The UE receives the scheduling message every scheduling period. 2번 스케줄링 메시지를 수신한 단말은 그 메시지에 포함된 수신 유보 정보를 획득하고, 상기 수신된 수신 유보 정보에 따라 상기 5번의 스케줄링 메시지가 전송될 때까지 스케줄링 메시지의 수신을 유보한다. The terminal receives a scheduling message 2 obtains a reception reservation information included in the message, and in accordance with the received reservation information, the received reserved for reception of scheduling messages until the five scheduling message is transmitted. 따라서, 2번 스케줄링 메시지를 수신한 단말은 3번과 4번의 스케줄링 메시지를 수신하지 않는다. Therefore, the terminal has received the scheduling message 2 does not receive the 3 and 4 a single scheduling message. UTRAN은 2번 스케줄링 메시지를 수신하지 못한 단말들을 위해 3번 스케줄링 메시지을 통해 수신 유보 정보를 전송한다. The UTRAN transmits the reservation information received through 3 mesijieul scheduling for the terminal does not receive a No. 2 scheduling message. 이때 3번 스케줄링 메시지에 포함되는 수신 유보 정보는 4번 스케줄링 메시지의 수신을 유보할 것을 단말에게 알려준다. The reception reservation information included in the three scheduling message informs the UE that reception of the reservation to fourth scheduling message. 더욱 구체적으로는, 여기서 수신 유보 정보에 포함된 스케줄링 메시지 수신 유보 구간의 값은 1이며, 이는 단말이 상기 3번 스케줄링 메시지의 수신 이후에 전송되는 1개의 스케줄링 메시지의 수신을 유보해야 함을 지시하는 것이다. More specifically, where the value of the reception reservation section scheduled message contained in the received reservation information is 1, which is indicative of the terminal that it should reserve the reception of the three one scheduling message transmitted after reception of a scheduling message will be. 한편 단말의 입장에서는, 3번 스케줄링 메시지를 수신하여 상기 스케줄링 메시지에 포함된 수신 유보 정보를 획득하고, 상기 수신 유보 정보에 따라 상기 5번의 스케줄링 메시지가 전송될 때까지 스케줄링 메시지의 수신을 유보한다. On the other hand the position of the terminal, receiving the three scheduled message acquires the reception reservation information included in the scheduling message and reserves reception of scheduling messages until the five scheduling message is transmitted in accordance with the received reservation information. 따라서, 3번 스케줄링 메시지를 수신한 단말은 4번의 스케줄링 메시지를 수신하지 않는 것이다. Therefore, after receiving the scheduled message, the terminal 3 is not receiving the four scheduling message. UTRAN은 2번과 3번 스케줄링 메시지를 수신하지 못한 단말들을 위해 4번 스케줄링 메시지을 전송한다. The UTRAN transmits fourth scheduling mesijieul for the terminal does not receive a scheduling message three times and two times. 4번 스케줄링 메시지는 상기 특정 MBMS 서비스에 대해 4번 스케줄링 메시지와 5번 스케줄링 메시지 사이에 전송될 데이터가 없음을 알려준다. Fourth scheduling message informs that there is no data to be transmitted between the fourth scheduling message and the fifth scheduling messages for the specific MBMS service. 한편, 4번 스케줄링 메시지를 수신한 단말은 전송할 데이터가 없음을 알고 5번의 스케줄링 메시지가 전송될 때까지 MBMS 데이터가 전송되는 채널을 수신하지 않는다. On the other hand, receiving a scheduling message is sent four times the terminal knows that there is no data and does not receive the MBMS channel data is transmitted until a single scheduling message 5 is sent. UTRAN은 5번 스케줄링 메시지를 통해 5번 스케줄링 메시지와 6번 스케줄링 메시지 사이에 전송되는 데이터의 전송 정보를 단말에게 통지한다. UTRAN notifies the transmission information of data to be transferred between the fifth scheduling message and the sixth scheduling message to the UE via the fifth scheduling message. 상기 전송 정보는 상기 데이터의 전송 시작점과 전송 구간의 길이를 포함한다. The transmission information includes a length of a transmission start point and transmission period of the data. 상기 과정에서 수신을 유보한 단말들이나 그 외 상기 서비스를 수신하고자 하는 단말은 5번 스케줄링 메시지를 수신하고, 그 메시지에 포함된 데이터의 전송정보에 따라 5번 스케줄 링 메시지와 6번 스케줄링 메시지 사이에 전송되는 데이터를 수신한다. Between the subscriber station desiring to receive a terminal or other the service reserved for reception in the process # 5 scheduling message reception, and time 5 scheduling in accordance with the transmission information of the data contained in the message, the message and the sixth scheduling message It receives the data to be transferred. 도7은 본 발명의 바람직한 일 실시예에 따라 이동통신 시스템의 단말에서 매 스케줄링 주기마다 UTRAN으로부터 전송된 스케줄링 메시지를 수신하여 수신된 스케줄링 메시지에 따른 처리 절차를 도시한 것이다. Figure 7 illustrates the processing procedure according to the received scheduling message receives a scheduling message transmitted from every scheduling period in a terminal of a mobile communication system according to an embodiment of the present invention UTRAN. 특정 MBMS 서비스를 수신하고자 하는 단말은 그 서비스를 위한 점대다 무선베어러(radio bearer)의 설정 정보 및 상기 특정 MBMS 서비스의 데이터 전송을 지원하기 위한 스케줄링 메시지의 전송 주기인 스케줄링 주기 정보를 UTRAN으로부터 획득한다[S71]. UE desiring to receive a specific MBMS acquires configuration information and the transmission period of the scheduling period information of a scheduling message for supporting a data transmission of the specific MBMS service in a many-to-many points for that service RB (radio bearer) from the UTRAN [S71]. 상기 단말은 획득한 무선베어러 설정 정보에 따라 상기 점대다 무선베어러를 설정한다[S72]. The UE sets a radio bearer the many-to-many points according to the acquired radio bearer configuration information [S72]. 상기 점대다 무선베어러가 설정되면 상기 MBMS 서비스 를 제공하기 위해 필요한 프로토콜 계층 및 채널의 특성이 규정되고, 각각의 구체적인 파라미터 및 동작 방법이 설정되는 것이다. If the point-to-multipoint radio bearer is set, the characteristics of a protocol layer and a channel required for providing the MBMS service is specified, it will be the respective detailed parameters and operation methods are set. 상기 단말은 획득한 상기 스케줄링 주기 정보를 이용하여 특정 물리채널을 통해 상기 UTRAN으로부터 전송되는 스케줄링 메시지를 수신한다[S73]. The UE receives a scheduling message transmitted from the UTRAN via a specific physical channel using the acquired scheduling period the information [S73]. 상기 단말은 수신한 스케줄링 메시지의 내용을 확인한 후[S74], 상기 스케줄링 메시지의 내용에 따라 다음과 같이 동작한다. The user terminal after confirming the contents of the received scheduling message [S74], according to the content of the scheduling message operates as follows. 상기 스케줄링 메시지에 포함된 내용이 데이터 전송 정보, 즉 데이터의 전송 시작점과 전송 구간의 길이와 같이 데이터가 언제 전송될 것인지에 대한 정보일 경우, 상기 단말은 데이터를 수신하기 위해 상기 데이터 전송 정보에 따라 상기 물리채널을 불연속적으로 수신하고[S74], 다음 스케줄링 주기에 전송될 스케줄링 메시지의 전송을 기다린다. If the information included in the scheduling message data communication information, i.e. information about whether the data is time to be transmitted, such as the length of the transmission start point and transmission period of the data, the user terminal a response to the data transmission information in order to receive data receiving a physical channel discontinuously, and [S74], and then waits for transmission of the scheduling message to be transmitted in the scheduling period. 상기 스케줄링 메시지에 포함된 내용이 수신 유보 정보인 경우, 상기 단말은 수신 유보 정보가 지시하는 구간 동안 또는 수신 유보 정보가 지시하는 횟수 동안 스케줄링 메시지의 수신을 유보한다[S75]. If the information included in the scheduling message reception reservation information, the mobile station receives reserve information to the reservation for reception of scheduling messages for a number of times during the reception reservation information or an instruction section that instructs [S75]. 따라서, 상기 단말은 상기 구간 또는 횟수 동안 상기 물리채널을 수신하지 않고, 상기 구간 이후 또는 상기 횟수 이후에 전송되는 스케줄링 메시지를 기다린다. Therefore, the MS does not receive the physical channel during the interval or number, waits for a scheduling message transmitted after the period or after the number. 상기 스케줄링 메시지에 포함된 내용이 해당 스케줄링 주기에 데이터의 전송이 없음(No data)을 알려주는 정보일 경우, 상기 단말은 해당 스케줄링 주기 동안 상기 물리채널을 수신하지 않고[S76], 다음 스케줄링 주기에 전송될 스케줄링 메시지의 전송을 기다린다. If the information included in the scheduling message il The transmission of the data information indicating that there is no (No data) in the scheduling period, the UE does not receive the physical channel during the corresponding scheduling period [S76], the next scheduling period It waits for transmission of the scheduling message to be transmitted. 상기 스케줄링 메시지에 포함된 내용이 상기 MBMS 서비스에 대한 상기 무선베어러의 해제를 알려주는 정보인 경우, 상기 단말은 상기 무선베어러를 해제하고[S77] 상기 특정 MBMS 수신 과정을 종료한다. If the information included in the scheduling message which is information indicating the release of the radio bearer for the MBMS service, the UE releases the radio bearer and exit [S77] the specific MBMS receiving process. 상기 스케줄링 메시지가 전송되는 물리채널과 상기 MBMS 데이터가 전송되는 물리채널은 동일한 물리채널인 것이 바람직하다. The physical channel is the physical channel and scheduling the MBMS data that the message is sent the transmission is preferably in the same physical channel. 바람직하게는, 상기 물리채널은 SCCPCH 채널이다. Preferably, the physical channel is an SCCPCH channel. 한편, 상기 MBMS 데이터는 상기 SCCPCH 채널에 매핑되는 논리채널인 MTCH를 통해 전송되고, 상기 스케줄링 메시지는 상기 SCCPCH 채널에 매핑되는 다른 논리채널을 통해 전송되는 것이 바람직하다. On the other hand, the MBMS data may preferably be transmitted via a logical channel MTCH is mapped to the SCCPCH channel, the scheduling message is transmitted via a different logical channel mapped to the SCCPCH channel. 이상의 실시예에서는 본 발명의 기술적 특징이 3GPP(3rd Generation Partnership Project)에서 표준화 작업이 진행되고 있는 비동기식 무선 이동통신 시스템에 적용된 경우를 중심으로 설명하였으나, 본 발명에 따른 기술적 특징은 MBMS 서비스와 같은 점대다(point-to-multipoint) 멀티미디어 서비스를 제공하는 다른 이동통신 시스템에 적용될 수 있음은 자명하다. In the above embodiment, although a description is made of a case applied to an asynchronous radio mobile communication system in which the standardization is underway in this technical feature of the present invention, 3GPP (3rd Generation Partnership Project), the technical features according to the invention are much the same with the MBMS service many-to-many (point-to-multipoint) can be applied to other mobile communication systems that provide multimedia services is obvious. 즉, 점대다 멀티미디어 서비스를 제공하는 네트워크와 상기 네트워크로부터 상기 점대다 멀티미디어 서비스를 수신하는 적어도 하나 이상의 단말로 구성되는 이동통신 시스템에서 본 발명의 기술적 특징을 적용할 수 있다. That is, point-to-multipoint it can be applied to the technical features of the present invention in a mobile communication system which is comprised of network and the network providing the multimedia services of at least one terminal for receiving a multimedia service that the many-to-many. 본 발명은 본 발명의 정신 및 필수적 특징을 벗어나지 않는 범위에서 다른 특정한 형태로 구체화될 수 있음은 당업자에게 자명하다. The invention can be embodied without departing from the spirit and essential characteristics of the present invention in other specific forms will be apparent to those skilled in the art. 따라서, 상기의 상세한 설명은 모든 면에서 제한적으로 해석되어서는 아니되고 예시적인 것으로 고려되어야 한다. Accordingly, the detailed description of the above is not restrictive construed in all aspects and should be considered as illustrative. 본 발명의 범위는 첨부된 청구항의 합리적 해석에 의해 결정되어야 하고, 본 발명의 등가적 범위 내에서의 모든 변경은 본 발명의 범위에 포함된다. The scope of the invention should be determined by reasonable interpretation of the appended claims and all modifications within the equivalent scope of the invention are included within the scope of the invention. 본 발명에 따른 점대다 멀티미디어 서비스 전송 및 수신 방법에 따르면 점대다 멀티미디어 서비스의 데이터를 불연속적으로 수신하는 단말이 배터리와 같은 단말 자원을 효율적으로 사용하도록 할 수 있는 효과가 있다. Many-to-many points according to the point-to-multipoint multimedia service transmission and reception method according to the invention has the effect that can be a terminal for receiving data of a multimedia service discontinuously so as to effectively use the resources, such as battery terminals. 단말 제어 방법. Terminal control method. MX2007003435A MX2007003435A (en) 2004-09-24 2005-08-29 Transmitting/receiving point-to-multipoint service in wireless communication system.